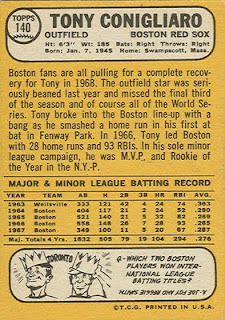 Tony Conigliaro was a rising star for the Boston Red Sox in the mid-1960s. This power-hitting rightfielder was the fastest player to reach 100 homeruns, and was considered to have a chance to eventually break Babe Ruth's record. He was beaned in late 1967, and was never the same after that. Conigliaro began in class-A ball in 1963. After just 1 year, he was up to the big club in 1964. He led the league in homeruns in his 2nd year. 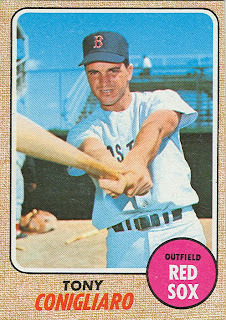 In August 1967, Conigliaro was hit in the eye by a pitch from the Angels' Jack Hamilton, and was out for the season, missing the World Series. 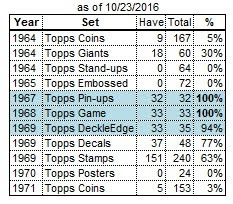 In fact, although this is his 1968 card, he also didn't play at all in 1968. 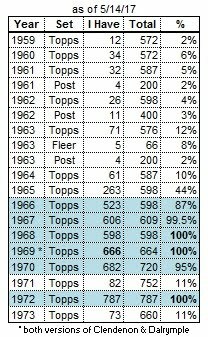 He resumed his career on opening day 1969, and played in 141 games in 1969 and 146 in 1970, while hitting 20 and 36 homeruns in those seasons. After 1970, he was traded to the Angels with Ray Jarvis and Jerry Moses for Doug Griffin, Jarvis Tatum and Ken Tatum. (Never had so many guys named Jarvis or Tatum been included in the same deal!) Tony only played in 74 games for the Angels that year (hitting only 4 homers). After being released by the Angels, Conigliaro signed with Boston again in 1975, but after 21 games (all as a DH or pinch-hitter), he was forced to retire due to permanent eye damage. Several years later, he suffered a heart attack, and then a stroke, and remained in a coma for several years until his death in 1990. Tony's life was like some kind of Greek tragedy. He had become a sportscaster up here in Providence, and was on his way to the airport with his brother Billy (who also played for the Red Sox,) to audition for a job in San Francisco. Due to heavy traffic, by the time they got to the hospital, the oxygen had been cut off so long to his brain it had been left heavily damaged. It was a slow, sad, downhill from there.